The CBr4 Controller is designed to control the pressure and the valves of a CBr4 gas injector in an MBE system. The CBr4 Controller has been designed for reliable continuous operation in a production environment as well as being simple and intuitive to use. The CBr4 Controller incorporates digital and serial hardware which allows control of up to four solenoid valves and a pressure controller. 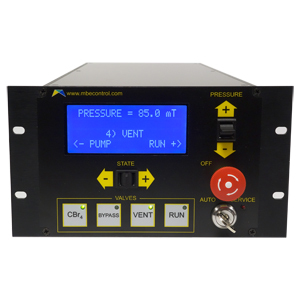 Using a remote computer connection or the front panel, the unit can control the gas flux from a CBr4 gas injector. The CBr4 Controller consists of a rack mounted controller that powers up to four 24VDC solenoid valves and controls the pressure setpoint of a remote pressure controller via a serial connection.